Endoscopic submucosal dissection (ESD) of colorectal lesions with severe submucosal fibrosis remains challenging. Fibrosis has also been implicated as a factor that increases the risk of incomplete or complicated dissection   . Several traction techniques have been described but remain to be established  . Traction by gravity seems to be one of the most useful methods for colorectal ESD . We therefore devised a new gravity-based traction tool. This technique uses magnetic beads ([Fig. 1 a]) to apply traction. The weight can easily be adjusted by using an additional magnetic bead and the direction of traction by changing the patient’s position. Magnetic bead-assisted ESD (MBA-ESD) is able to improve the field of vision, increase resection efficiency, and reduce risks of perforation and of cutting into lesions, as well as shortening the treatment time and lowering the costs. Fig. 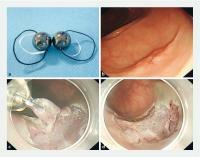 1 Magnetic bead-assisted endoscopic submucosal dissection. a The magnetic beads that are used to apply traction by gravity. b – d Endoscopic views showing: b a flat adenoma with fibrosis in the descending colon; c the specimen being resected with magnetic bead-assisted traction; d the ulcer bed after resection. A 55-year-old man with a flat neoplasm with a central ulcer scar (15 × 10 mm) in the descending colon ([Fig. 1 b]) was admitted to our hospital to undergo colorectal ESD. Endoscopic mucosal resection had failed at another hospital owing to incomplete lifting of the lesion. After a mixed glycerol–sodium–hyaluronate solution with diluted epinephrine and indigo carmine had been injected into the submucosal layer, an incision was made using a Dual-Knife. Difficulties arose immediately after we started the dissection because of severe submucosal fibrosis. Despite repeated injections, no lifting could be achieved and the submucosal layer could not be precisely exposed, with no accurate line of muscle layer evident. 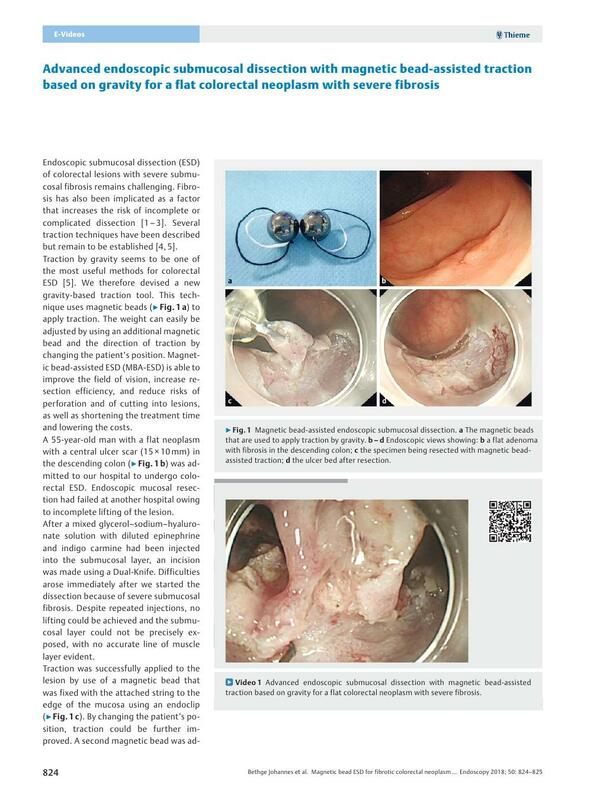 Traction was successfully applied to the lesion by use of a magnetic bead that was fixed with the attached string to the edge of the mucosa using an endoclip ([Fig. 1 c]). By changing the patient’s position, traction could be further improved. A second magnetic bead was added to increase the weight and the strength of the traction. Thereafter, a precise cutting line was exposed so that careful dissection could be continued with the Hook-Knife. The lesion was completely resected en bloc with no complications ([Fig. 1 d]; [Video 1]). Histological findings revealed a tubulovillous adenoma (R0) accompanied by extensive fibrosis. Video 1 Advanced endoscopic submucosal dissection with magnetic bead-assisted traction based on gravity for a flat colorectal neoplasm with severe fibrosis.